My family is a big fan of hash browns. Every single person in the house loves them, and that is rarely the case unless it is chocolate or some type of candy. The problem when I make crispy hash browns is that my pan is not large enough. Now sure, I could break out the electric flat griddle, but I don’t. One, large pan of hash browns does not feed all five of us, and trust me, there are looks of disappointment when there are no more hash browns to be eaten with remaining pancakes and bacon. So this past week when we decided to have breakfast for dinner (an all-time favorite of ours), I decided to attempt baking hash browns on a large sheet pan. Not only was I able to use the whole bag and feed everyone, but I was also able to provide that crispy exterior while keeping the potatoes tender inside. Start by preheating your oven to 375 degrees. Line your sheet tray with enough parchment paper to cover the top of the tray. Pour the olive oil over the hash browns, and sprinkle the salt and pepper over the top. Get in there with your hands and mix the hash browns, ensuring that you get some of the oil and salt and pepper to coat those potatoes. 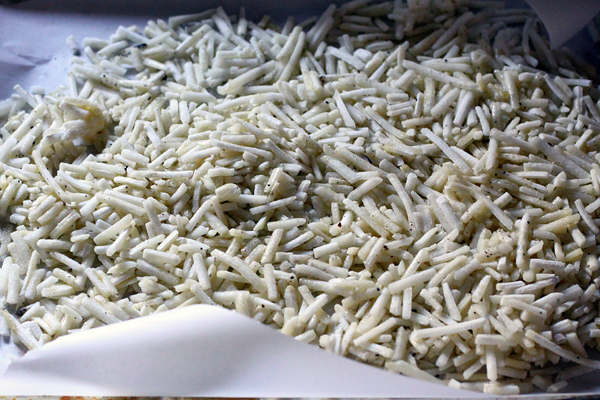 Place the tray in the preheated oven and cook for 15 minutes. After 15 minutes, remove from the oven, and give them a toss. Place back in the oven and cook another 15 minutes, or until crispy. When you are ready to serve, simply slide the hash browns off the parchment paper onto your plate or bowl, and dig right in. Crispy, and tender, these baked hash browns satisfied everyone at the dinner table, and I will make these again. 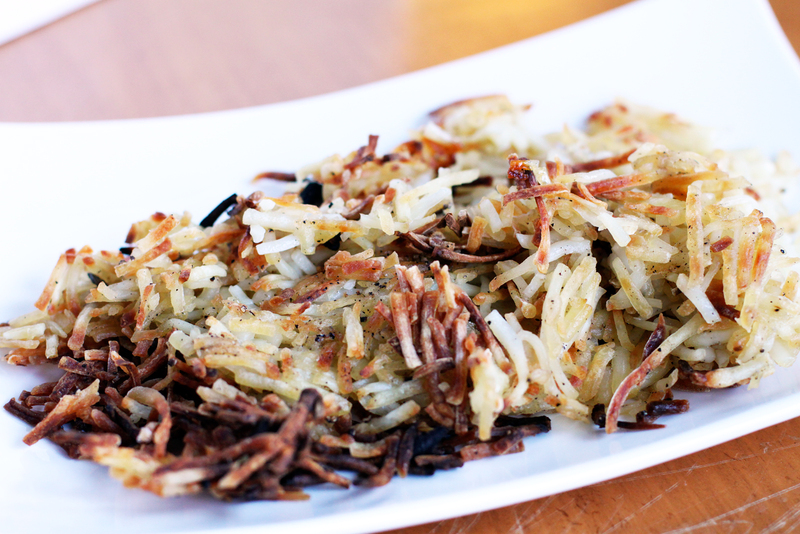 Have you tried baking hash browns before? Do you prefer the skillet or the baking method? Hey Dax, I just moved to the Mpls. area and was wondering if you’re a chef for Palermo’s pizza? There can’t be too many guys in Milwaukee with the name Dax!! If so, say hi to Lori and Giacomo! Hehe. Hey Lisa, no, I’m no chef for Palermo’s, however I am very familiar with their pizza and location by Miller Park. I’ve been wanting to visit their plant and restaurant, so next time I visit, I will let them know you say hello to Lori and Giacomo! Hi Rae – A bag could probably feed four, no problem. So go from there. I suppose it all depends on the appetite as well. Would this work with cubed frozen hash browns? Hi Amanda, you could definitely try the cubed version. They should work but might take a little bit longer in the oven. Good luck! I don’t have parchment paper could I use foil? Hi Shylah, you could use alumninum foil, or just on a baking sheet as well. Good luck! Kristina… I hear you. Just keep an eye on them and toss and turn for your desire tenderness. I can’t wait to try this method. I think i’ll try it tonight actually. I’m gonna add onion’s and sausage also. So I think what i’ll do is cook the potatoes and onions in the oven and the sausage on the stovetop than add them together in a bowl and call it dinner tonight. So you don’t thaw them first? I thought that I would need to thaw the bag and dump them in a kitchen towel to get rid of any extra moisture. Correct. Just drizzle with olive oil, gently stir, and bake. Just keep an eye on them as most ovens are a bit different in temp. Yes, this yielded crispy hash browns. But it took more than 90 minutes! I even turned up the heat to 400 degrees. And I know my oven runs about 15 degrees hot. Be sure to give yourself plenty of time. But it was still better than standing over a frying pan. I tried it twice. The first time I followed the proportions and it took forever and never was as crisp as I wanted. The second time I used a 16 oz bag of hash browns with the 3 T olive oil on my biggest pan (12’x18″) with parchment paper hanging over the edges and followed the directions and it turned out great in the time specified. Thank you for posting. Makes getting breakfast done soooo much faster and easier.